Golden Globe Awards: Meryl Streep & Best Director Angelina Jolie? Meryl Streep in The Iron Lady. 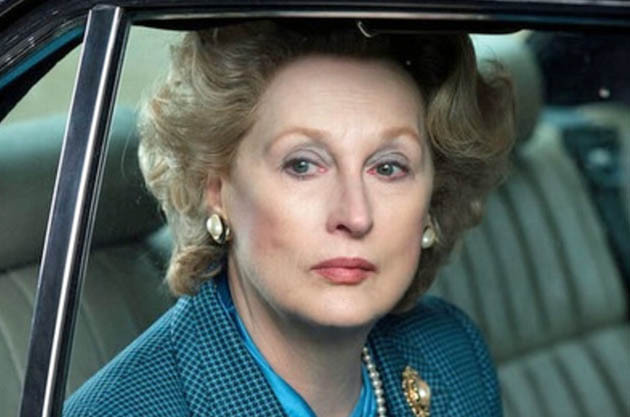 The Golden Globe Awards' Best Actress in a Motion Picture - Drama category will definitely include Meryl Streep for her portrayal of former British Prime Minister Margaret Thatcher in Phyllida Lloyd's Thatcher-lite The Iron Lady. That will mark the 17th nomination for Streep, who took home two Golden Globe statuettes in the long ago past: as Best Supporting Actress for Robert Benton's Kramer vs. Kramer (1979) and as Best Actress - Drama for Alan J. Pakula's Sophie's Choice (1982). Our SAG Award predictions were mostly, though admittedly not totally, accurate. We did, however, correctly predict every single contender for SAG's Best Actress Award. So, here we are with our last-minute Golden Globe Awards Predictions in various motion picture categories. In a way, the Golden Globes are easier to predict than the SAG Awards or the Oscars because, generally speaking, if you're star, you're in. Hence, Johnny Depp and Angelina Jolie and The Tourist last year. Meryl Streep, The Iron Lady. Tilda Swinton, We Need to Talk About Kevin. That matches our SAG Award predictions – and the SAG nominations themselves. These are also the likely Best Actress Oscar contenders. Rooney Mara, The Girl with the Dragon Tattoo. Sandra Bullock, Extremely Loud & Incredibly Close. Cannes Film Festival Best Actress winner Kirsten Dunst is a runner-up runner-up for Lars von Trier's apocalyptic drama Melancholia. Due to her lesser star wattage, an even less likely contender is Elizabeth Olsen for Martha Marcy May Marlene. Felicity Jones (Like Crazy) and Brit Marling (Another Earth) have basically no chance here. The Los Angeles Film Critics Association's selection, South Korean Poetry actress Yun Jeong-hie, has no chance at all, even if eligible. Golden Globe Awards Predictions: Julia Roberts among Best Actress in a Motion Picture Comedy or Musical nominees? Now comes the entertaining part, the Golden Globe Awards' Best Actress in a Motion Picture Comedy or Musical category: Kristen Wiig is in for Bridesmaids and so is Charlize Theron for Young Adult. Who else? Julianne Moore, Crazy Stupid Love. Rachel McAdams, Midnight in Paris. Julia Roberts, Larry Crowne (it's okay to either laugh or sing; after all, this is a comedy or musical category). Additionally, there's always the possibility that My Week with Marilyn will be considered a comedy. If so, Michelle Williams will definitely be listed here (replacing Rachel McAdams and being replaced by Rooney Mara in the Best Actress - Drama category). Else, Bérénice Bejo could be considered a lead actress for The Artist. Julia Roberts would then get the boot. Jennifer Aniston, Horrible Bosses or Just Go with It. Noomi Rapace, Sherlock Holmes: A Game of Shadows. Mila Kunis, Friends with Benefits. Or maybe Katy Perry for The Smurfs and Tyler Perry for Madea's Big Happy Family. Brad Pitt in Moneyball. One of the top Hollywood stars of the last two decades, Brad Pitt has a good chance of becoming a double Golden Globe Awards nominee for his performances in Bennett Miller's baseball drama Moneyball and Terrence Malick's family drama/cosmic inquiry The Tree of Life. In case that does happen, it remains to be seen whether Pitt will be a double nominee in the Best Actor in a Motion Picture - Drama category, or if The Tree of Life will earn him a Best Supporting Actor nod. Pitt has been nominated for four Golden Globes, winning as Best Supporting Actor for Terry Gilliam's Twelve Monkeys (1995). Brad Pitt, The Tree of Life. George Clooney, The Ides of March. Gary Oldman, Tinker Tailor Soldier Spy. Demián Bichir was a SAG Awards surprise nominee for his performance as an undocumented immigrant in Chris Weitz's A Better Life, but we don't really expect Bichir will be as lucky with the Hollywood Foreign Press Association. He would possibly have a better chance had A Better Life co-starred Robert Pattinson or Kristen Stewart, two of the leads in Weitz's The Twilight Saga: New Moon. As a starless small movie – in terms of budget and box office – A Better Life has little to no chance of earning Bichir a Best Actor nod. George Clooney, The Descendants (assuming it's listed as a comedy). Owen Wilson, Midnight in Paris. And then things get tricky. Our guess would be Joseph Gordon-Levitt for the box office disappointment 50/50 and Robert Downey Jr. for Sherlock Holmes: A Game of Shadows, though we certainly wouldn't find it surprising to find Johnny Depp listed for the box office bomb The Rum Diary – or even Pirates of the Caribbean: On Stranger Tides. Or both. A couple of other possibilities are Ewan McGregor for Beginners and Steve Carell for Crazy, Stupid, Love. Of course, the Hollywood Foreign Press Association could also choose to list Mission: Impossible - Ghost Protocol as a musical so they could nominate Tom Cruise, who does some pirouetting in that one. Or perhaps the HFPA will go for Eddie Murphy in Tower Heist. That might help to soothe Murphy's ego following the Oscar fiasco of a few weeks ago. But then again, it might not. Mel Gibson for Jodie Foster's The Beaver? Unlikely, though stranger things have happened at the Golden Globes. If Bérénice Bejo is listed as a lead actress in a comedy or musical, then Shailene Woodley would be in for The Descendants. Sissy Spacek & Bryce Dallas Howard, The Help. Marion Cotillard, Midnight in Paris. Albert Brooks in Drive. 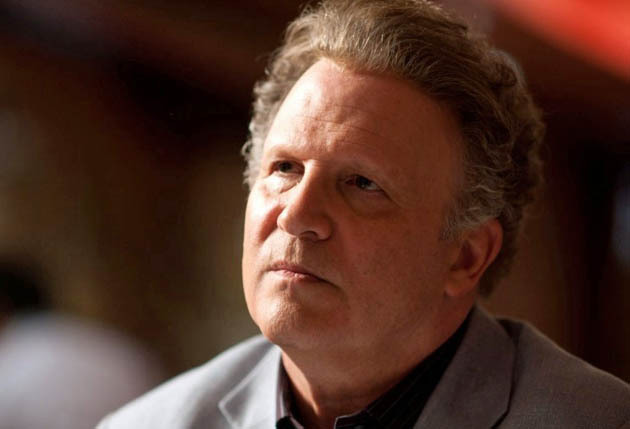 Best known for playing humorous characters, Albert Brooks (Lost in America, Defending Your Life) has received some of the best reviews of his career for his portrayal of a dour, violent gangster in Nicolas Winding Refn's thriller Drive. One of this awards season's top two Best Supporting Actors – the other being Christopher Plummer for Beginners – Brooks will likely be shortlisted for the Golden Globe Awards despite the fact that he has been just bypassed for the SAG Awards. In case Brooks does get nominated, that'll be his first chance to take home a Golden Globe statuette. For the Golden Globe Awards' Best Supporting Actor category, shoo-ins are Christopher Plummer for Beginners and Albert Brooks for Drive – the latter a shoo-in who inexplicably was left out of the SAG Awards, whereas Armie Hammer was included for J. Edgar. We're betting on a first-time Golden Globe Awards nomination for Brooks. Kenneth Branagh (as Laurence Olivier) in My Week with Marilyn. Andy Serkis (as a talking chimpanzee) in Rise of the Planet of the Apes. Nick Nolte (as a recovering alcoholic turned devout Catholic) in Warrior. Max von Sydow, Extremely Loud & Incredibly Close. Jeremy Irons & Kevin Spacey, Margin Call. John Hawkes, Martha Marcy May Marlene. Christoph Waltz, Water for Elephants or Carnage. As an aside, potential Golden Globe Awards first-timer Albert Brooks already has a Best Supporting Actor Academy Award nomination to his credit: for Broadcast News, a 1987 comedy-drama directed by James L. Brooks – no relation despite the middle-name connection (James L. Brooks was born James Lawrence Brooks while Albert Brooks was born Albert Lawrence Einstein). Stephen Daldry, Extremely Loud & Incredibly Close (the power of Tom Hanks & Sandra Bullock). In addition to, are you ready, Angelina Jolie for In the Land of Blood and Honey. Michel Hazanavicius is a shoo-in for The Artist simply because he can't be ignored. In case In the Land of Blood and Honey hasn't been made available for viewing, we're betting on Payne as one of the Top Five. A nomination for Lars von Trier – for Melancholia – would have been fascinating, but that's hardly likely to happen. The Help with Emma Stone. The Golden Globe Awards' Best Motion Picture - Drama category will likely be filled with movies featuring big names either in front or behind the camera. One of them will surely be Tate Taylor's sleeper domestic box office hit The Help, with Emma Stone leading a cast that also includes likely Golden Globe Best Actress - Drama nominee Viola Davis, likely Best Supporting Actress nominees Jessica Chastain and Octavia Spencer, in addition to Bryce Dallas Howard, Allison Janney, Mike Vogel, Chris Lowell, Ahna O'Reilly, and veterans Mary Steenburgen, Sissy Spacek, and Cicely Tyson. Star director Martin Scorsese's Hugo. Star director Steven Spielberg's War Horse. Moneyball (the Brad Pitt effect). Extremely Loud & Incredibly Close (once again, the Sandra Bullock & Tom Hanks effect). Carnage (if listed as drama). George Clooney's The Ides of March isn't an impossibility, but it's a less likely nominee considering that Clooney will already be getting his invitation to the party via The Descendants. Awards season fave The Artist. Assuming it's listed as a comedy, The Descendants (the George Clooney effect). Star director Woody Allen's all-star Midnight in Paris. Paul Feig's sleeper box office hit Bridesmaids. Jason Reitman's Young Adult (the Charlize Theron effect). Mike Mills' Beginners is a less likely possibility, but Roman Polanski's Carnage could sneak in if listed as a comedy. Runners-up include The Artist, Hugo, and J. Edgar. Asghar Farhadi's A Separation (Iran). Aki Kaurismäki's Le Havre (Finland / France). Pedro Almodóvar's The Skin I Live In (Spain). Nadine Labaki's Where Do We Go Now? (Lebanon). Zhang Yimou's The Flowers of War (China) – so The Dark Knight Rises' Christian Bale will feel compelled to come to the party. Meryl Streep The Iron Lady image: The Weinstein Company. 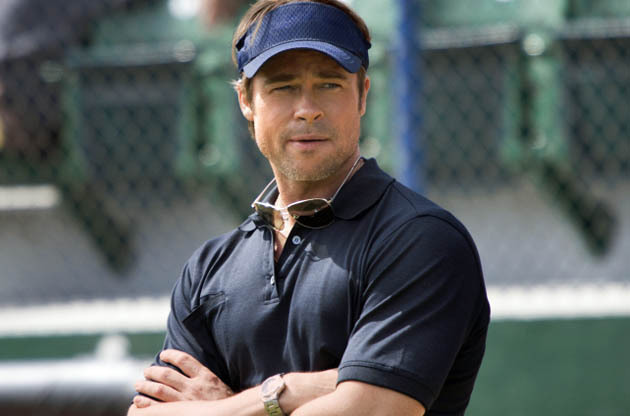 Brad Pitt Moneyball image: Columbia Pictures. Albert Brooks Drive image: FilmDistrict. Emma Stone The Help image: Walt Disney Studios. “Golden Globe Awards: Meryl Streep & George Clooney Shoo-Ins + Best Director Angelina Jolie?” last updated in June 2018. J. Edgar is make up,Carrell is himself,Dujardin is great and Depp is great in pirate same padt.